First silkyterrier moved to our home 1989. Bombix Moren silky terriers are very famous in Europa, but also in USA. Our Bombix Moren Whirwind Endeed is first Silkyterrier who has visit at the rings in USA. She win 4xBest of Breed 1995 and take part also to specialty.The 1# silky female in Finland 2001, visited 2002 Denver Specialty and she won Best Of Winners there.Nice win to longtail silky. On the photo on this page you see our European Winner 2000 Bombix Moren Silverstar Copy.She has several champion and winner titles as Champion of Spain. Irma Leino have award with Lauri Vuolasvirta breederprize 1998. There is only two silkyterrierbreeders in Finland who have got this very famous prize given by our finnish kennel council. First given 1997 to Silja Susia and Stenilja Silkyterriers. On these page you see only our " old" silkies , please welcome visiting to our new websites Our Bombix Moren Silky Terriers have won BOB in Crufts 2006 Multi CH Bombix Moren Ex Improviso and 2009 Int & CH of irland, Celtic Winner 2009 Bombix Moren Dosis Maxima, 2008 our Bombix Moren Dosis Maxima won BOS. Please feel free to look newest news from our new sites http://www.bombixmoren.eu The photo down is from Kotka Finland international dogshow. 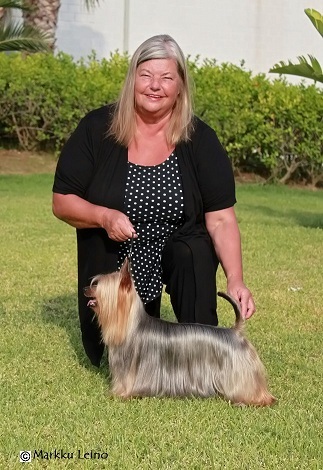 BIS 4 breeder group winner Bombix Moren Silky Terriers 2009.